If there's one word to surmise the exceedingly strange third entry in the Rebuild of Evangelion series it's 'melancholy'. For a franchise that often counteracted its dark, apocalyptic tidings (both personal & literal) with bursts of lighthearted humour and fan service, You Can (Not) Redo massively shifts the tone established in its two predecessors, bringing things much more in line with the divisive final chapters of the original TV series and films. This is Shinji Ikari's film, who awakens almost a decade and a half after 'melding' with an Evangelion unit during the last film's beautifully grand conclusion. Hideaki Anno (here supported by three other co-directors) has always found inspiration for the series through his own battles with depression, and here Shinji experiences the new world in a state of constant confusion, alienation and - yes - crippling melancholy. This approach is implemented both narratively and technically. Shot in 2.35:1 - a change from the first two Rebuild films - the film successfully manages to be grander in scope yet more intimately insular at the same time. The colour palette is extremely muted compared to previous films, drenched in discomforting reds and greys, while even Shiro Sagisu's typically excellent soundtrack is much more sombre in its bombast and re-imaginings of earlier series themes. In terms of story, the film enters uncharted territory, easily negating criticisms that its predecessors (1.11 especially) redundantly retreaded over-familiar ground. It's a brave trajectory, significantly altering the progression of both characters and the overall mythology (although plenty of hints remain that the 'rebuild' will ultimately be revealed as either a sequel or prequel to the Neon Genesis movement). One of the film's biggest gambles is its willingness to alienate its core 'otaku' fanbase - who, as sharply criticised in End of Evangelion (I wrote about that here), often completely missed the point of the series anyway. Anno and co. intend completely to confuse us, to get lost in these weird, dense happenings for ourselves. In this sense, we're elegantly immersed into Shinji's own confusion as he deals with the world-altering pressure put on his shoulders. If this sounds like excusing confusing plotting, it's not - it's actually a vast improvement and more naturalistic approach to helping the audience relate with the protagonist than the literal 'in his head' dreamscapes that awkwardly brought the TV show to a halt. Now, that's not to say the exposition doesn't grow incredibly dense and confusing at times - even series veterans will find themselves lost in an increasingly heavy flow of references to dozens of Eva units, Angels in disguise, Gods, Lilin and other mythological lore (not to mention a certain Instrumentality Project). And there's a few strange gaps in logic and coherence. But, for the most part, no Evangelion film has so successfully gotten inside the troubled mind of Shinji Ikari, with even the cinematography - ranging from cold, distant wide angles to intense, uneasy and shifting close-ups - working hard to capture that increasing melancholia and bemusement. One of Evangelion's core fascinations has always been its willingness to engage in a dialogue with itself - almost as if Anno himself is trying to figure out what this all means on-screen. And the subtitle here gives a quick insight into one of the major philosophical questions posed here - can you redo? What's the point of this 'remake' series? Can it provide a worthy successor to the accomplished although divisive original series and films? Characters here wonder aloud about their free agency and destiny within the context of the story, but there's without doubt a meta-layer to their ponderings - although to a certain degree it's only the questions raised here, and the audience and creators will have to ruminate on them further in the lead-up to part four. The film's characterisation has been harshly criticised by many fans, with the massive internal chronological gap distorting the motivations of characters compared to where we left them in You (Can) Not Advance. And there's no doubt that the likes of Misato are on the sidelines, even if their newly distrustful, distant ways are easily justified by fourteen years of off-screen development and turmoil. But elsewhere the supporting cast undergo some genuinely intriguing, successful changes. A newly ret-conned 'arrested development' experienced by the teenaged Eva pilots is a wise call - while the cynic will no doubt suggest this was done in order not to screw up the franchise's lucrative domestic merchandising, the perpetually teenage Asuka particularly is granted an effective new justification for her perpetual sour mood. 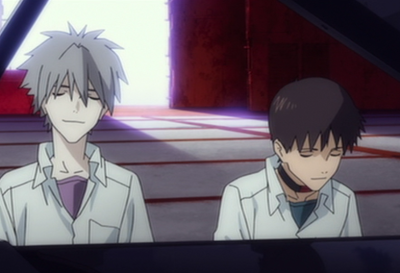 But the character most fascinating is Kaworu - the mysterious Eva pilot and stealth Angel. His interactions with Shinji in the particularly sombre second-act offer the film's best scenes as they bond over a piano. The growing trust between the two of them - with Kaworu half twisted manipulator, half genuine kindred spirit - is completely credible, and is brought to an end with a shocking, effective punctuation mark during the film's extended action climax (yep, there's a fourth impact to contest). Evangelion 3.33 is a more immensely difficult film that the preceding two, no doubt, and requires the audience accept some significant, controversial alterations to an iconic series. Some of the gambles don't pay as many dividends as others, and without a shadow of a doubt this a less immediately satisfying film than 2.22 (while the action here is imaginatively presented, for example, it's not as instantly memorable as a certain two setpieces last time). Another undeniable concern is that it's very much the 'beginning of the end' - like many penultimate chapters of stories, it's unfinished, with many of the lingering concerns and questions left unanswered as we await the conclusion in the forthcoming Evangelion: Final (let's hope the wait isn't as long as we had to endure before this one). Yet Evangelion 3.33 - You Can (Not) Redo is a fascinating, brave, unnerving and maddening film. It's Evangelion to the core, then, just not exactly as we know it.